Sometimes you need to get off the grid and have a bit of privacy. With the proliferation of phones that don't have removable batteries, it becomes fairly difficult. Many other technologies such as RFID are embedded in identification documents and credit cards. It is easy to wrap up these items in aluminum foil or in RF blocking Mylar bags, but you risk being unfashionable or as being branded a paranoid lunatic. To control when and where your wireless devices can talk, a company called MIAmobi has created a fairly ordinary looking pouch that has a silver foil lining that blocks RF. The company's website does not state specifics on the RF attenuation or what the frequency range that it blocks. 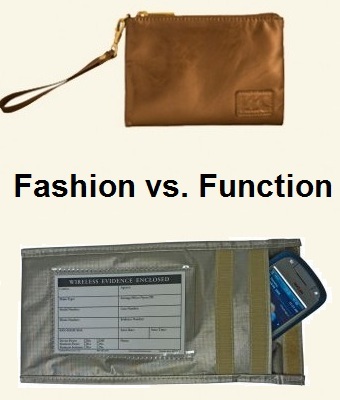 A similar, less expensive, less fashionable bag can be had from Ramsey (yeah, the guys who make the FM transmitter kits), which is designed for cell phone forensic testing.